I am looking for the ability to send an email to all our Attorneys via BlackBerry (1000+) that contains a link. Upon clicking the link a multimedia file will either download and play or stream. This multimedia file can be actual video or a PowerPoint-type stack that contains audio and automatic slide change. The critical factor is that the population of Attorneys do not have to open up a separate application on the BB thus making using the BB for learning as easy and seamless as possible. According to Gartner, the PDA market (Personal Digital Assistants) showed record shipments of 17.7 million devices, an increase of 18.4% from the previous year. Gartner defines a PDA as a data-centric handheld computer weighing less than 1 pound that is primarily designed for use with both hands (collectively known as “BlackBerry’s,” or “CrackBerry’s” for the addicted). Examples include the RIM BlackBerry 8707v, HP iPAQ 69xx, Nokia E61, Motorola Q, T-Mobile Dash and Sidekick. So there is a huge installed base of senior executives who “wear” a potential training device. There are a number of on-going pilots of companies already exploring using the Blackberry for training. 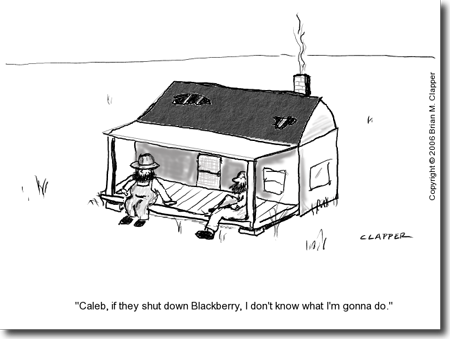 Often the target markets are senior executives who use BlackBerry 24X7 in their job. One that comes to mind is a series of pilots being rolled out in 2008 targeting Merrill Lynch Investment Bankers. The objective is to provide corporate mandated training to Investment Bankers over Blackberry. What’s interesting is how the pilot is organized: Merrill Lynch is using their internal Learning and Human Resource staff as the first pilots to work out technical issues as well as test out the ergonomics of programs. Research points to the need for heavy investments in recruiting high paid professionals as compared to investments in training high paid professionals. Deloitte Research finds that the typical US company spends nearly 50 times more to recruit a $100,000 professional than it will invest in their annual training once they are on-board. What has been your experience in using the BlackBerry for learning? Share it here with our readers.